AUV technology to pipeline inspection and sualization tools in Fledermaus; and Qarto offer cost-effective, innovative solutions our brand new ENC production toolkit. Booth #: H200 inspection information. 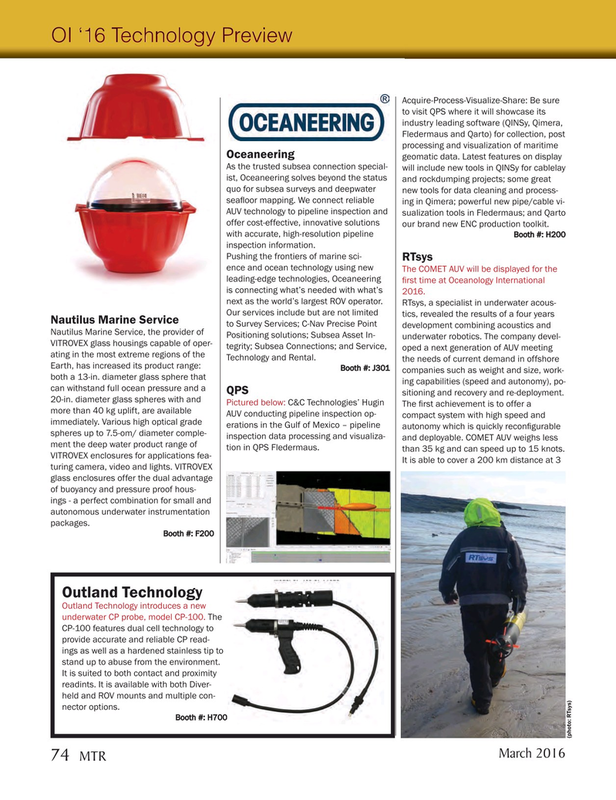 The COMET AUV will be displayed for the leading-edge technologies, Oceaneering ? rst time at Oceanology International is connecting what’s needed with what’s 2016. next as the world’s largest ROV operator. QPS sitioning and recovery and re-deployment. AUV conducting pipeline inspection op- compact system with high speed and immediately. Various high optical grade erations in the Gulf of Mexico – pipeline autonomy which is quickly recon? gurable spheres up to 7.5-om/ diameter comple- inspection data processing and visualiza- and deployable. COMET AUV weighs less ment the deep water product range of tion in QPS Fledermaus. than 35 kg and can speed up to 15 knots. It is able to cover a 200 km distance at 3 turing camera, video and lights. VITROVEX glass enclosures offer the dual advantage of buoyancy and pressure proof hous- ings - a perfect combination for small and autonomous underwater instrumentation packages. CP-100 features dual cell technology to provide accurate and reliable CP read- ings as well as a hardened stainless tip to stand up to abuse from the environment. It is suited to both contact and proximity readints. It is available with both Diver- held and ROV mounts and multiple con- nector options.